Most of us in Derbyshire are familiar with ‘Well Dressing’. Those of us not directly involved, stand amongst the astonished visitors, admiring the fabulous images created using natural materials pushed into clay. But do we really know what effort goes into producing this spectacle, or why people bother with something so painstaking and time-consuming? Georgina Tanner (née Slack) takes us on a privileged, behind-the-scenes glimpse into one Derbyshire village’s well dressing preparations. The precise origins of well dressing are hazy, with little documented and much theorised. The widely-held belief is that well dressing derives from pagan practices (perhaps from as far back as the Celts), which were modified by, and incorporated into the Christian Church. Tissington is often referred to as the ‘mother-place’ of well dressing. This is because the revival of well dressing in a form that we might recognise today, is thought to have taken place here. 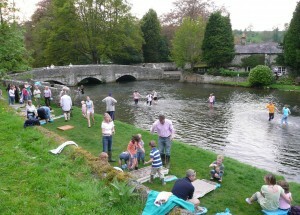 In the summer of Sixteen Fifteen, during a prolonged drought, all of Tissington’s wells remained in flow. 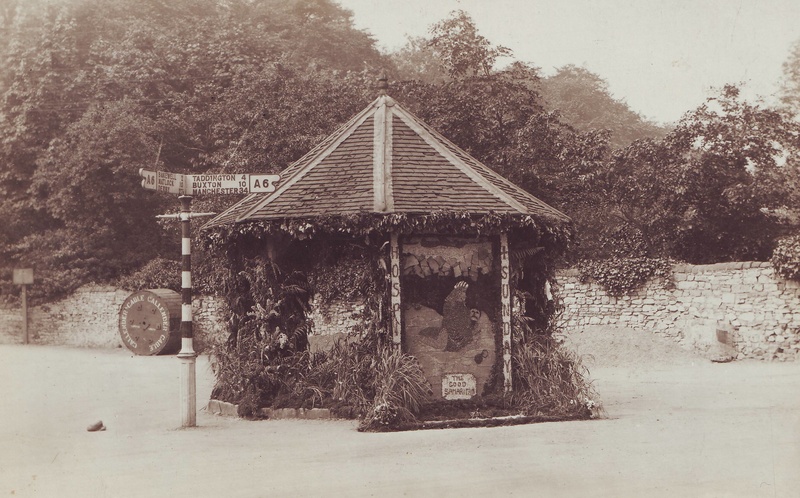 As an act of thanksgiving, villagers decorated the wells with flowers, mosses, ferns and other foliage, arranged on the ground to produce sentences, primarily from the scriptures. Sheepwash Well, thought to have been taken in the Nineteen Twenties or Thirties. This demonstrates the continuation of the ‘Floralia’ tradition. Photograph courtesy of Mr. & Mrs. T. C. Bettney. The custom became known as ‘Floralia’ (possibly derived from the ‘Floralia’, an ancient Roman festival dedicated to Flora, goddess of flowers and the spring) or ‘well dressing’. It is thought to have evolved into the creation of an almost ‘grotto’ effect around the wells. Later, as the familiar clay-filled boards emerged, they remained framed by a dense layer of foliage in ‘Floralia’ tradition, and mirrors were set amongst the plants to create the illusion of water. Today, around 60 Derbyshire towns and villages uphold the tradition of well dressing, which remains virtually exclusive to the county. 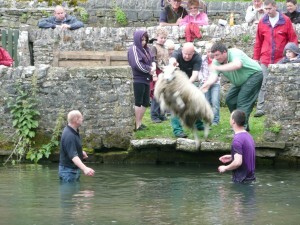 Tissington’s are the first of the season, which runs from May to September each year. On a spring day in Nineteen Fifty-Four, a woman pedalled furiously on her bike from Ashford-in-the-Water to Youlgrave. She was on an important mission; one which she could not have imagined would have such a huge impact on Ashford-in-the-Water, even to this day. She had been asked by the new Vicar, Rev. George, to restore the ancient custom of ‘well dressing’ to the village. This once enthusiastically upheld tradition, like so many things, had died out with the onset of Word War II, and remained dormant for almost 20 years. Now the Vicar wanted it revived in time to celebrate Trinity Sunday, the Patronal Festival of Ashford’s Holy Trinity Church. Ida Thorpe didn’t know anything at all about well dressing; she had no idea about boards, clay, petalling, and certainly not drawing, and she had just nine days to do it! Youlgrave villagers kindly explained exactly what was involved, and offered their help. Later that day, Ida set her husband to work constructing a wooden board, whilst she attempted to sketch out a simple Biblical design for the well dressing. Permission was granted from the Duke of Devonshire to extract clay from a pit at Hassop station, and the board was duly filled. The design was marked out from the drawing onto the clay, and natural materials were collected to create the image. With a gargantuan team effort, the board was completed on time and a new era of well dressing in Ashford was born. The tradition flourished year on year, with additional boards being created and decorated. Ida also developed her own three-dimensional style, with plants and objects stretching out in front of the board. Little has changed since those days, except that villagers now create six well dressings; one for each of Ashford-in-the-Water’s wells. This collective annual effort is steered by the Well Dressing Committee, a dedicated band of residents who meet monthly from January. However, well dressing begins in October for Committee Secretary, when they apply for the license from Derbyshire Dales District Council to collect donations for charity at the well sites. 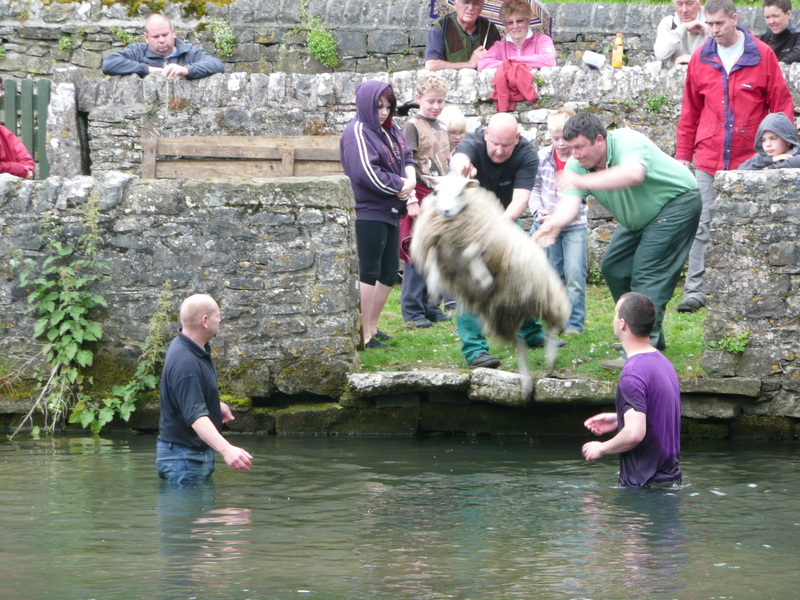 Early on in the year the themes for the wells are chosen, often something contemporary (a national/international celebration or anniversary) or perhaps a Biblical subject. A hymn relevant to the theme is then picked, to be sung during the procession and blessing of the wells on Trinity Sunday. A Silver Band is booked for the procession, and Police permission obtained for the roads to be closed. Posters are printed, and well dressing guides produced, which explain the themes and a give a brief history of each well (with a map). The guides also detail the various activities taking place in the village during well dressing week, and are sold throughout the village for a mere £1 (donated to charity). All this effort, and before the official well dressing period has even begun! 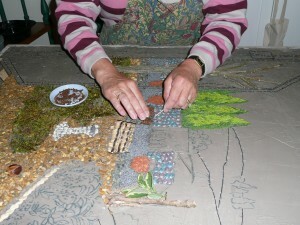 The wooden boards used for well dressing are constructed using a ‘lath and plaster’ technique (but without nails which might catch on well dressers’ hands), and their dimensions are dependent on those of the well they frame. 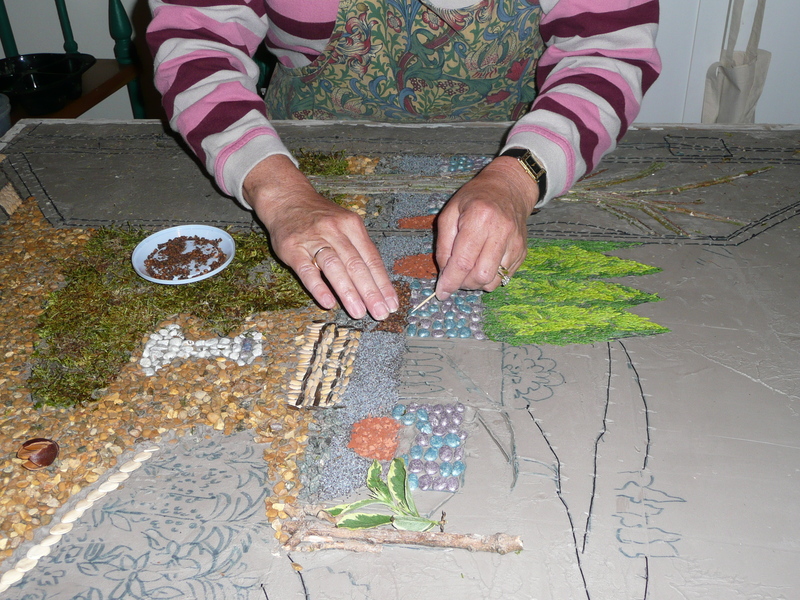 A single well dressing may comprise several boards: top, bottom, middle and sides. They alter little from year to year, save for any necessary repairs. The boards are first placed in the River Wye to soak, in a pile weighed down with stones, and secured to the edge with rope; the damp wood is believed to retain moisture in the clay. 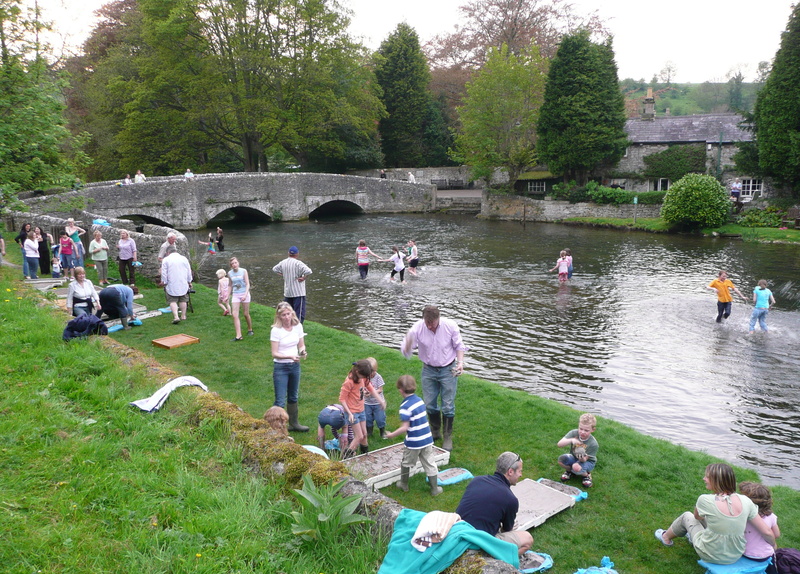 One week later, the banks of the river near Sheepwash Bridge are teeming with children (and adults) of all ages, for the much-anticipated ‘claying of the boards’. Clay is literally ‘splatted’ on to the boards, filling a depth of a few centimetres, and the surface skimmed to produce a smooth finish. This year, one tonne of potter’s clay was required which is more expensive than previously used powdered clay, which can no longer be obtained. The children, eager with excitement, become covered from head to toe in clay and delight in making hand prints on each other’s backs, before racing into the shallow water to see who can get soaked first! Meanwhile, the adults finish the job, but great fun is had by all. The boards are then taken to their temporary ‘homes’; various garages and buildings around the village, where groups of residents (mainly women) hunker down, night and day, for the next week to complete the finished article. ‘Filling in’ a ‘wooled’ design using natural materials. Drawings will have been sketched onto big pieces of paper during the preceding weeks, usually laid out across a living-room floor. They are placed on top of the clay, and the design pricked through using a cocktail stick or needle, leaving something resembling a ‘join-the-dots’ picture. The outline of the design is then created, usually using black wool pushed at intervals into the clay, in a technique known as ‘woolling’. The design is ‘filled in’ using a mixture of both wild and garden flowers and leaves pushed into the clay, along with other natural materials such as sheep’s wool, sweet corn, alder cones, lichen and fluorspar. For example, in 2008 there was a hydrangea dress, a geranium coat, a straw flagpole with ceanothus leaf flag, privet leaf lettering, lavender sky and eggshell skin; the imagination runs wild! Delicate petals (the first to dry out) are left until the last possible moment, and inserted into the clay like overlapping roof tiles, enabling raindrops to trickle off. As happens fairly frequently, one of this year’s groups toiled into the early hours in order to finish their design on time, but it is unheard of for any board to remain incomplete. At 6.00am the next morning, it’s over to the ‘Heavy Gang’ (mainly men) and their trailer, who collect each board and transport it to its well site, where it is hoisted into position and secured in place. ‘Brute force’ is required to lift the extremely heavy boards. After three hours, the boards are in place and the ‘Heavy Gang’ retire to the Old School building for a well-earned ‘fry-up’, before installing donation boxes and ropes around each well, as well as signs around the village. The well dressings remain on display for a week, and some are lit up at night by wiring stretching out of people’s homes. The author’s husband demonstrating the “art of sheepwashing”. As if well dressings were not enough, the village is buzzing with activities to keep visitors enthralled throughout the week. These include a ‘sheepwash’ demonstration, where sheep are washed in the river to rid their fleece of dirt and the natural oil, lanolin (a clean fleece would have fetched a higher price). Demonstration of this age-old tradition, which is no longer practiced, requires permission from DEFRA and the consideration of some very modern health and safety issues! Inside the Church, a rich, sweet scent fills the air from the vibrant and colourful floral displays. There is a well dressing demonstration, a stunning Arts and Crafts display, scrumptious refreshments available for visitors in the Old School or Ashford Institute, and a comical scarecrow competition. After a week exposed to the unpredictable British weather, the boards start to look a little worse for wear. The natural materials are scraped off the surface of the clay using a wallpaper scraper, and as much of the clay as possible is retrieved, to be used again the following year. Two weeks later, participants gather together at a BBQ to celebrate their hard work, and mark another year’s outstanding achievements. Parsley, Petals and Rigor Mortis! So why do people give up so much time and energy to well dressing? There seem to be several, very admirable reasons to do so. One may be the opportunity to enhance and exhibit the creative skills involved in well dressing, which have been passed down through the generations. After all, well dressing surely is an art, requiring extensive expertise built upon year after year. One example is knowledge about the durability and weather resistance of different materials. Dorothy Daybell, who has been involved with well dressing in Ashford for almost 50 years, describes the example of the Queen’s horse (part of a design commemorating the Queen’s Golden Jubilee in 2002). That year, aubergine peel provided the perfect silky black of the horse’s coat, but only 24 hours after being pressed into the clay, it had shrivelled up and was hurriedly replaced by copper beech. The timing of well dressing, differing slightly each year, also exerts an influence. It is no use settling on a particular petal, if the plant is not yet in flower. A further consideration is whether sufficient quantities of a particular material can be gathered, to complete a certain area of the design. With identical side panels, one trick is to work with a particular colour on both sides at once. Should this material run out, this can be compensated for on both sides, which therefore match. Attention to detail is paramount (for example the musical notes of one design had to be accurate, as did the Chinese characters on another), as members of the public do notice, and will pass comment! Above all, well dressing provides people who may not normally consider themselves ‘artistic’, with an opportunity to participate in a highly creative process. Another motivation may be the fantastic sums of money raised for good causes, with the aim being to donate £1,000 each year. The groups working on each well get to choose their own charity, to which £100 is donated, with the Well Dressing Committee determining recipients for the remainder. A range of local organisations benefit, both within the village itself, and in the surrounding area. Yet this is not without obstacles. In 2007, a donations box was stolen from beside a well, with the thief gaining an estimated £12. This is not the first incident of its kind, with money also having been taken from beside the Children’s Well, created each year by the children of Ashford. In another incident, one well was subject to shocking vandalism, when it was slashed with a knife. Yet, is there an even more powerful reason to take part in well dressing? As people beaver away on the wells, the sound of voices and laughter emanate from the garages. Much of the labour is sustained by copious cups of tea, and in some cases, delicious home-baked cakes! Neighbours use the opportunity to catch up with each other’s news (some may only come together like this once a year, at well dressing time). There are also the reminiscences; senior residents recall how, in the Nineteen Sixties, they had to endure a two-year ‘apprenticeship’ under Ida Thorpe, pressing in only parsley, before they were allowed to advance on to petals! There are also memories from childhood; one resident recalls picking flowers with the Vicar as a ten-year-old. When she had the misfortune to lose her Wellington boot in the process, the Vicar brought her home in a wheelbarrow! Despite hours of back-breaking work, hunched over the boards, humour is never absent. This year, one resident commented “By the time the board was finished, we had spent so long sitting in one position that rigor mortis had set in!” When asked why they participate, another resident replied “It’s a labour of love, a challenge, and we’re mad!” Madness may come into it, but teamwork, camaraderie and a sense of achievement must surely be the biggest draw. So, if your town or village continues to uphold one of Derbyshire’s most distinctive traditions, and you are not already involved, why not consider it? After all, you can’t beat the feeling of being part of something special. Celebrating the 50th anniversary of Martin Luther King’s “I Have a Dream” speech. Celebrating 50th Anniversary of Doctor Who. Celebrating the 210th birthday of Joseph Paxton, the former head gardener of Chatsworth. Georgina pressed her first sweet corn into the clay, whilst attending Ashford-in-the-Water C. of E. Primary School between 1983 and 1986. Georgina would like to thank Ashford Well Dressing Committee and the residents of Ashford, for their generosity and support in compiling this article. An edited version of this post was published in Reflections, August 2008. It’s now mid May, the cows are back in the fields and everything is burgeoning forth as we hopefully await a sizzling summer! We have now had two Cream Tea Sundays at the Village Hall and both were extremely successful and much appreciated by those who sampled our scrumptious large scones with lashings of jam and cream. They made £400 in total to put towards the present on-going refurbishment and running costs of the Village Hall. The latter keep going ever higher especially the electricity costs as everyone is experiencing. A tremendous vote of thanks goes to all those involved and to all those who organised, helped and brought items for sale; they sold out extremely swiftly, always a sign of great quality. Bunting evening took place on May 12th and as always was a jolly occasion. It was a well attended evening to renew/replace our worn out bunting with sewing machines whirring, tea and refreshments on hand and plenty of chat, produced miles of new bunting ready for Sheldon Day. Not a little wine was consumed to help oil the needles and so it was a fun evening! The new bunting will be gracing the village street during the week of the Fell Race which is Thursday July17th and Sheldon Day itself which is Saturday July 19th. Angela is looking after the raffle this year – we all need to sell as many tickets as we can. Top prize this year is a helicopter ride – wow! We have heard from Angela and Andy that daughter Alice has a new job which she started on 19th May in London. She will be working for NDCS (National Deaf Children’s Society) as an assistant project manager on their Deaf Children Worldwide Project. Great news and congratulations. Congratulations go to Adrienne and Noel who will be celebrating their 60th wedding anniversary on June 5th. Some of us help every year at Ashford Well Dressing. It is backbreaking stuff but the camaraderie is great and the end results are beautiful. The well dressings go up on Saturday 14th June but if you would like to help on any of them in the week prior to this or if you would like to be part of the heavy gang (the chaps who put the wells up early on the Saturday morning) then do let us know and we can put you in touch. Your chance to meet and chat with Canon Tony in an informal setting over coffee/tea and a piece of cake. A visit to Taddington and a walk around the village with Ray Slack.